His is one of several properties managed by Bruce with Holiday Rentals Mexico. This Mexico City apartment in historical center in a great complex which is only three blocks from the opera house Bellas Artes, an area filled with bars, cafes and restaurants. This district is considered as one of the safest in the city. We offer personalized service offer our guest a tour of the condo complex facilities along with pointing out restaurants and grocery stores and such with-in the first day of their stay. A private car service with our highly recommend bilingual driver is available upon request at very reasonable rates. We are also available to assist in coordinating your transportation needs. Flexible check in and check outs hours are offered whenever possible. The apartment is located in the award winning condominium community Puerta Alameda which provides excellent security staring with access to the building being limited to residents with magnetic security cards to the enter the building (Magnetic Security Cards provide to our guests during their stay) . Once entering the building you will be greeted by a doormen. The doormen and security are on duty 24/7. Luxury amenities for the complex include a heated lap size pools, a full size gym, a rooftop jogging track and sunning areas as well very tranquil patio / garden areas throughout the complex. Also there are comfortable lobby areas with sofas and chair to relax with free Wi-Fi provided in these common areas. For the business traveler, a conference room that accommodates 6-10 people can be reserved for meeting up to three hours long free of charge. 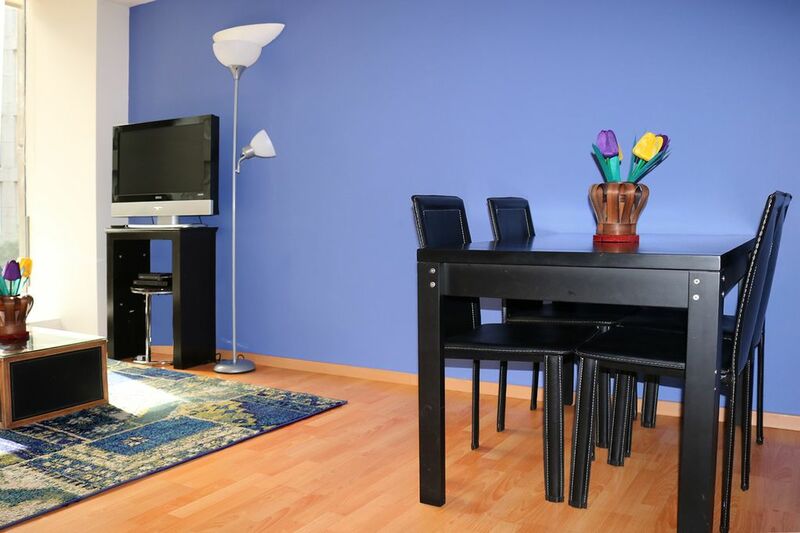 Location: The apartment is located in the historic of the city near the opera house Bellas Artes. The area where the complex is located is now considered one of the safest areas in the city (in the last ten year the government and major real-estate developers have invested heavily in the area). The condo is within walking distance, where visitors will find the Paseo de la Reforma, Parque Alameda and the Palacio de Bellas Artes, the Zocalo, the Ciudadela Crafts Market and several major museums and attractions. Two subway lines and the Mexico City Turibus line are a stone’s throw away. There is small to midsize grocery store three blocks away where you can buy most of your food. Tax rate 19% of rent tax rate Fees for additional guests may apply. Dear Mr Zhian, thank you so much for take your time and send us your review , we are really happy to know that your stay was ok, and everything was fine during your stay. This apartment was the perfect retreat for exploring the centro/historic area of Mexico City. Located in a card access building with staff at the door at all times. It seemed very safe... not that safety was ever an issue in the area. The building is on a side street off the famous Av. Juarez with it's hustle and bustle but the apartment faces the courtyard so is very quiet.It is spotlessly clean and a 'touch up' cleaning was provided half way through my week long stay. Drinking water and bath tissue are provided daily by the very helpful support staff who are available almost anytime via text. Excellent Wifi connection. The location is excellent for my art and architecture outings... and the art and architecture in Mexico City astounded me. Having traveled much of the world to see the best art, this city easily matched what I've seen. While there I signed up for the 7 day Ecobici bicycle plan (about $15 USD) and rode all over the city. There are several bike stands close to the apartment and it's pretty safe riding in the city... although city riding skills are strongly suggested. There are quite a few 'bike only' lanes on major roads. If you sign-up for Ecobici before you go (suggested) be aware you have to take an exam regarding bike safety before being issued your access code. Personally I think this is an excellent idea. Would I stay here again... absolutely! And I will. Estimada Srta Tovar, fue un gusto asistirle en Puerta Alameda Suites, muchas gracias por sus comentarios y calificación estamos muy contentos de haber cumplido sus expectativas que nuestro servicio haya sido de su entero agrado. this complex is so lovely, comfy and safe.